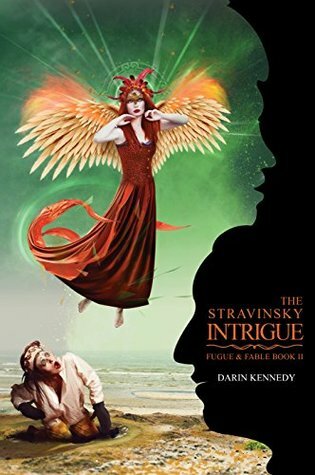 Kennedy fuses the archetypical symbolism of Stravinsky’s music with the individuality of modern life to create a tale of psychological exploration that is neither lacking in mystery nor overwhelmed with obscure metaphor. This novel is the second volume in the Fugue & Fable trilogy. As such, this review might contain some spoilers for The Mussorgsky Riddle. Nine months ago, psychic Mira Tejedor rescued Anthony Faircloth from a trap built from his own mind; and fell in love with Anthony’s psychologist, Dr Thomas Archer. However, days before Mira relocates to Charlotte, NC, to live with Thomas, a new mystery strikes the town: young girls are falling into inexplicable comas; comas that bear a startling resemblance to the one Mira rescued Anthony from. Unable to refuse a request for help from the police, Mira finds herself fighting through two apparently separate dreamscapes: built from Stravinsky’s The Firebird and Petrushka. As with the previous volume, Kennedy weaves parallel threads of common reality and musical otherland. However, with no apparent crime associated with the girls’ illness and Mira’s closest associates already believing in her ability to track using mystical impressions and enter mindscapes, the criminal investigation of the first novel is replaced with a focus on Mira’s personal life. This shift combined with the addition of a second psychic space built from music moves this book more toward Mira’s assumptions and intuitions than objective reality. As such – while Mira seeks to find the truth – readers might find her a less reliable narrator than in the previous volume; and have more difficulty unravelling the clues. While Kennedy does provide more of an explanation later in the book, the presence of two new dreamscapes built around famous music – especially with only one of them displaying a link to the comatose girls – does seem perhaps a little implausible to begin with. As with the previous volume, the musical psychodramas are well crafted, shifting from a close analogue of the music to a realm with more immediate impact upon the real world as Mira understands – or fails to understand – the relevance of certain symbols. Mira is, as before, a sympathetic protagonist. The stresses from the case, and from the resulting renewal of her association with Detective Sterling, provide a plausible challenge to her initially solid relationship with Thomas. This uncertainty in turn creates a realistic doubt to counter her previous experience of unweaving mind-traps. The supporting cast are similarly each a well-crafted balance of greater experience and doubts: with Mira’s rescue of Anthony both providing clear evidence she has real power and giving them cause for gratitude, they are inclined to help; but, with Anthony having a clear link to musical dreamscapes and Thomas having treated the current victims, this inclination becomes tainted with mutual uncertainty. Overall, I enjoyed this book. I recommend it to readers seeking strongly character-driven stories or work filled with symbolism. I received a free copy from the publisher with a request for a fair review.